This April will see the publication of the next in the series, Age of Aztec, which envisages a world where the Aztecs defeated the Conquistadors and then spread their empire across the Earth. As the apocalypse looms, this regime of ruthless oppression and regular human sacrifice is now openly defied by a masked vigilante known as the Conquistador. “For me, the appeal of the Pantheon series is that each novel is different,” says Lovegrove. “The pre-existing mythology creates the story and shapes the tone and direction of the book. Every time I start a new one, it's as though I've been given a brand new playground to play in. Yet the core themes remain the same: the relationship between mortals and the beings they worship; humans facing or wielding superhuman power; free will versus divine edict. A never-drying well of ideas to explore there. A thematic trilogy of related, but stand-alone novels, the Pantheon series addresses the theme of “men versus the gods” in different worlds, with three different pantheons. All high-action military SF books, the series has presented an armed uprising against distant but powerful Egyptian divinities, a high-powered slugfest between battle-suited humans and super-heroic Greek gods, and a gritty, intimate firefight between an infantry company and an army of ancient Norse giants. 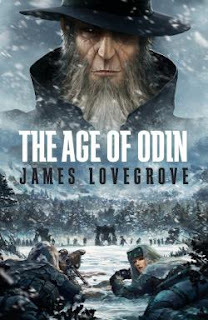 James Lovegrove published his first novel at the age of 24 and has since had more than 20 books out, including The Hope, Escardy Gap (co-written with Peter Crowther), Days, The Foreigners, How The Other Half Lives, Untied Kingdom, Imagined Slights, Worldstorm, Gig and Provender Gleed. His short fiction has appeared in magazines as diverse as Interzone and Nature and in numerous anthologies. He has written extensively for reluctant readers, with titles such as Wings, The House of Lazarus, Ant God, Cold Keep, Kill Swap and Dead Brigade. He has also produced a sequence of teen fantasy novels, the Clouded World series, under the pseudonym Jay Amory. He is a regular reviewer of fiction for the Financial Times and lives in Eastbourne on the south coast of England with his wife Lou, sons Monty and Theo, and cat Ozzy.